Is there a better alternative to SigniFigures? Is SigniFigures really the best app in Mathematics category? Will SigniFigures work good on macOS 10.13.4? 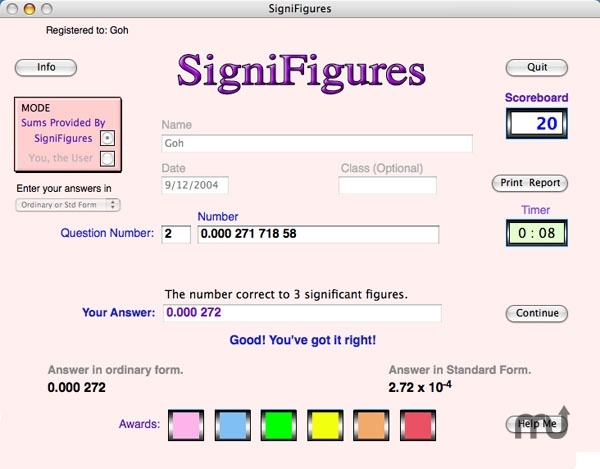 SigniFigures teaches students how to identify significant figures and how to give answers correct to the required number of significant figures. Simple rules are included to help students remember better. Animation is used to help student learn more easily. It can generate thousands of numbers (up to 300 per session) for drills but users may also provide their own numbers. It accepts answers in ordinary form or standard form (scientific notation). It marks automatically and can print a detailed report after each session. SigniFigures needs a review. Be the first to review this app and get the discussion started! SigniFigures needs a rating. Be the first to rate this app and get the discussion started!